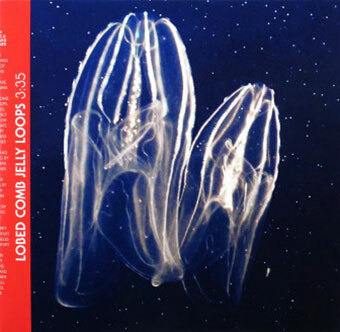 The basis of Lobed Comb Jelly Loops is a seven-second audio clip recorded on location by Stevens, featuring voices of Monterey Bay Aquarium visitors observing an invertebrate exhibit. Editing and effect-processing took place in Frankfurt by Schreiner. The clip is repeated, and with each successive play the fragmented speech becomes increasingly coherent. The seemingly simple structure of the audio is subverted by a constantly increasing volume and a number of envelopes that gradually slur the language from melodic to demonic. Fortunate Isles consists of two audio recordings: a field recording by Stevens of an Ethiopian Timket celebration in Los Angeles and an instrumental studio piece recorded by Schreiner in Frankfurt. Unfamiliar with Ethiopian chant, Stevens came upon the ceremony in the early morning near his home in Elysian Park, drawn in by the complex tonal qualities and vocal phrasing emanating through the landscape. The studio-piece by Schreiner brings to mind the invisible murmurings of an electrical grid amplified and pulsating at the surface. Played together, lap steel and vocals interact at random while subtleties of the environment such as cars whizzing down the canyon and avian life breathe through. The resulting 7-inch was made in collaboration and with geographic distance in mind. Both pieces share an interest in field-recording, the human voice, and the making of something that is more than the sum of it’s elements; a new creature, a kind of “third mind” (William S. Burroughs, Brion Gysin). The cover images for Lobed Combed Jelly Loops and Fortunate Isles were taken at the time of the field-recordings, both in early January, but one year apart nearly to the day. LeRoy Stevens, (born 1984, Park Ridge) lives and works in Los Angeles, California. Bernhard Schreiner, (born 1971, Mödling) lives and works in Frankfurt, Germany.